The Thermalogic Ultimate Blackout Liner is an energy efficient insulated curtain panel. Warm air stays in during winter, and cool air stays in during summer. Get a more restful sleep thanks to its room darkening characteristics. Plus, it saves you money on your energy bill, acts as a sound barrier so you can enjoy more peace and quiet, reduces glare on computer monitors and TV screens, protects carpets and furniture from sun fading, and is white on the back side to meet condominiums' requirements. Each panel has ½" side hems and a 1/2" bottom hem, and includes simple-to-follow instructions to attach to the back of your tab-top panel. 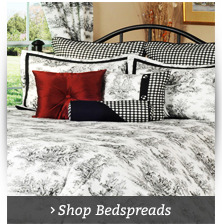 The Ultimate Blackout Liner will help turn your bedroom in the dark, peaceful space you've always imagined. 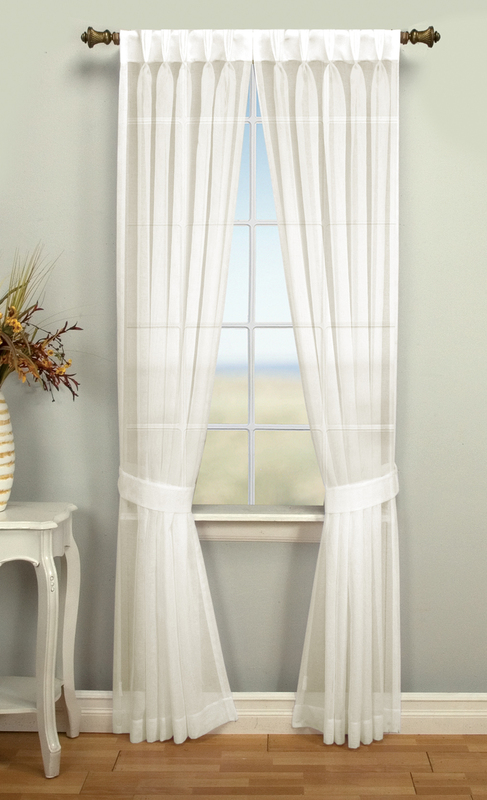 Block out the cold, the heat, the noise and the light all in one step when you attach this perfectly proportioned liner to your tab-top curtain panel. Follow the simple instructions included and turn the drapes you love into ones that do so much more for you. There's no need to get rid of curtains you love to get a better night's sleep in a too-bright, too-loud, uncomfortably hot or cold room. Just attach the Ultimate Blackout Liner and realize the peaceful joy of a bedroom that stays just the way you like it no matter the season or time of day. Weathermate Tab Top panels by Thermalogics have a thermal shade lining, are room darkening and machine washable. 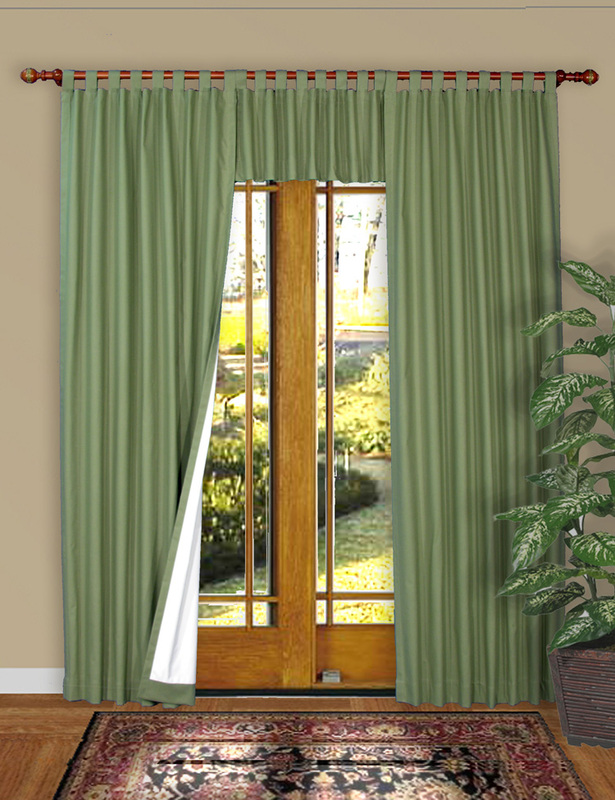 Weathermate Tab Top curtains are very energy saving, keeping out the summer heat and the winter cold, saving you money. Select from a range of sizes and colors, Weathermate Tab Top panels by Thermalogic have a thermal shade lining, are room darkening and energy efficient,keeping out the summer heat and the winter cold, saving you money. 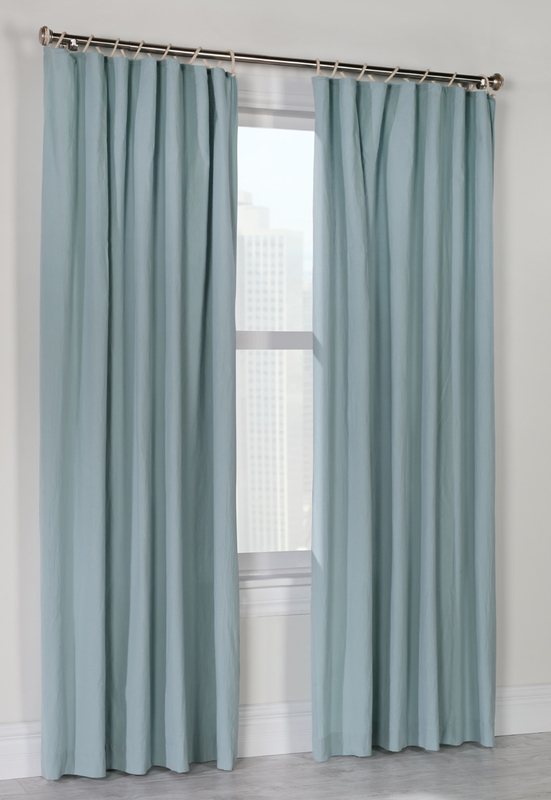 Our tab top curtains are designed to fit widths up to approx. one half the width of the product. Slip tabs onto a wood or decorative pole and space tabs evenly. Looking for tab top curtains that are beautiful and affordable? Look no further. Shop & Save. Panels are sold by the pair. 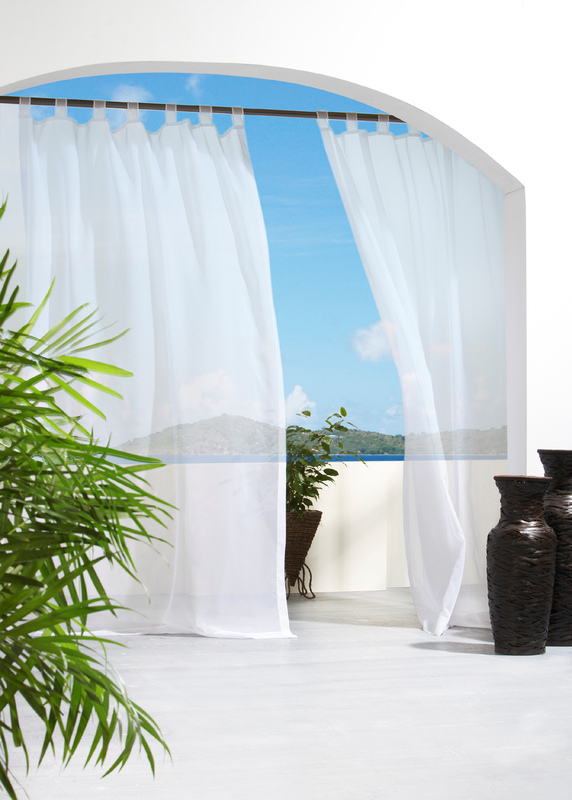 Escape Tab Top Indoor/Outdoor Curtain Panels are light, airy and beautiful. Made from solid color Polyester "treated" voile, the indoor/outdoor curtain panel is water-repellent and fade and mildew resistant. Eight hook and loop tabs per panel are reversible. * Use two panels for a standard window. Belle Swags are not included. 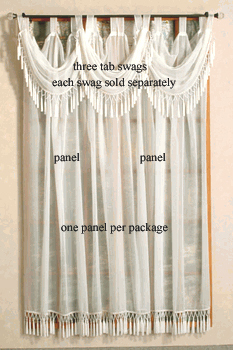 Gorgeous beaded and fringed tab top panels and stunning bell swag valances are made of 100% high twist voile. Bottom hem is magnificently embellished with hand crafted with delicate pearls in a chevron motif with attached tassels. Sheer tab top panels in 84" and 95" lengths and stunning bell swag valances are made of 100% high twist voile and hand crafted bead fringe with delicate pearls in a chevron motif with attached tassels. 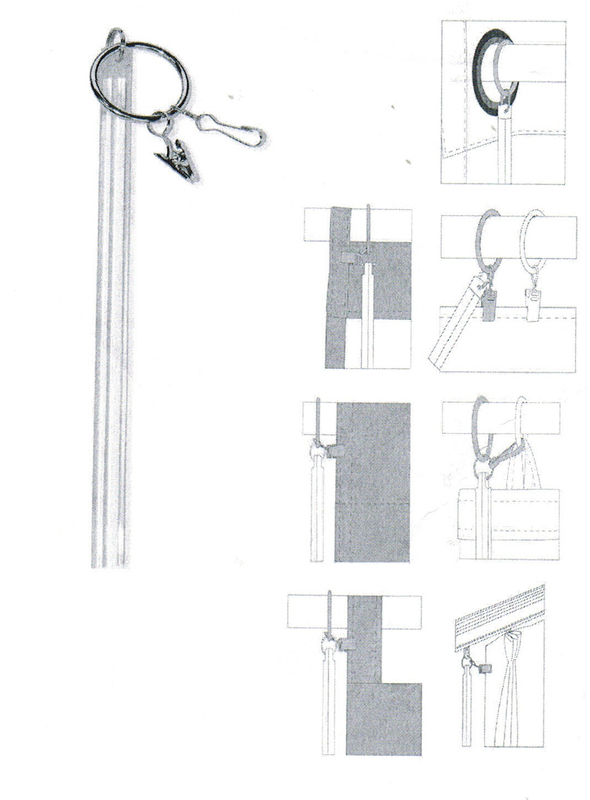 Photo shows two tab panels with three bell swags. Panels and swags are sold individually. Kazan is a 100% washed Cotton with a unique rope top for hanging on your decorative curtain rod. Each panel is tacked eight times and has 3/4 inch side hems and a three inch bottom hem. Panels are sold individually, one 50 inch wide panel per package. Select lengths of 63", 84", and 95". Colors include White Cream, Navy, Seafoam, and Burgundy. Palm Beach is a pretty semi sheer that gently filters incoming light. No pins are needed for this classic pinch pleat look. The back side features tabs for threading the curtain rod through. Made of easy care 100% Polyester, but feels has a soft cotton feel. 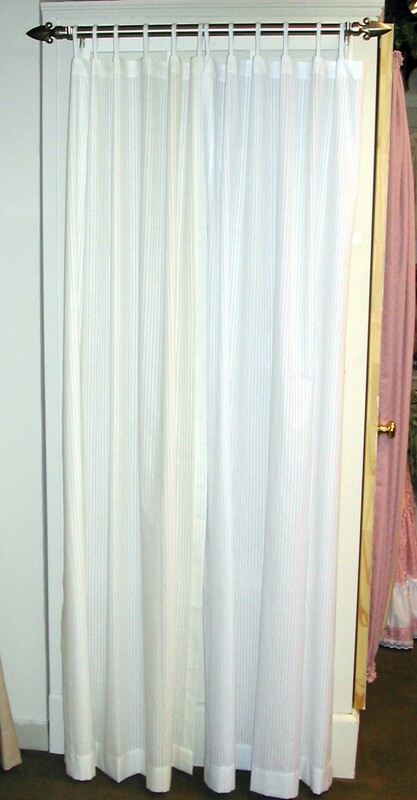 Curtain Pairs are 52 inches wide (two 26 inch wide panels), and is offered in widths of 63, 84, and 96 inches. You may also like shorter sizes. A pair of tie backs are included. Select colors of White or Ivory. Machine wash in cold water on gentle cycle, tumble dry on low heat, and minor low iron touch up. 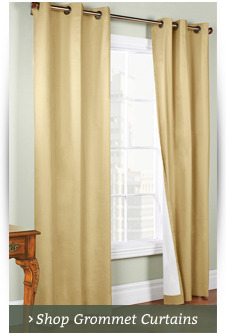 The Curtain Shop is your source for affordable, designer tab top curtains. Our tab top curtain panels are made with premium-quality fabrics and are available in a generous array of colors and designs. The curtains are easy to hang and will instantly transform the look and feel of any space. 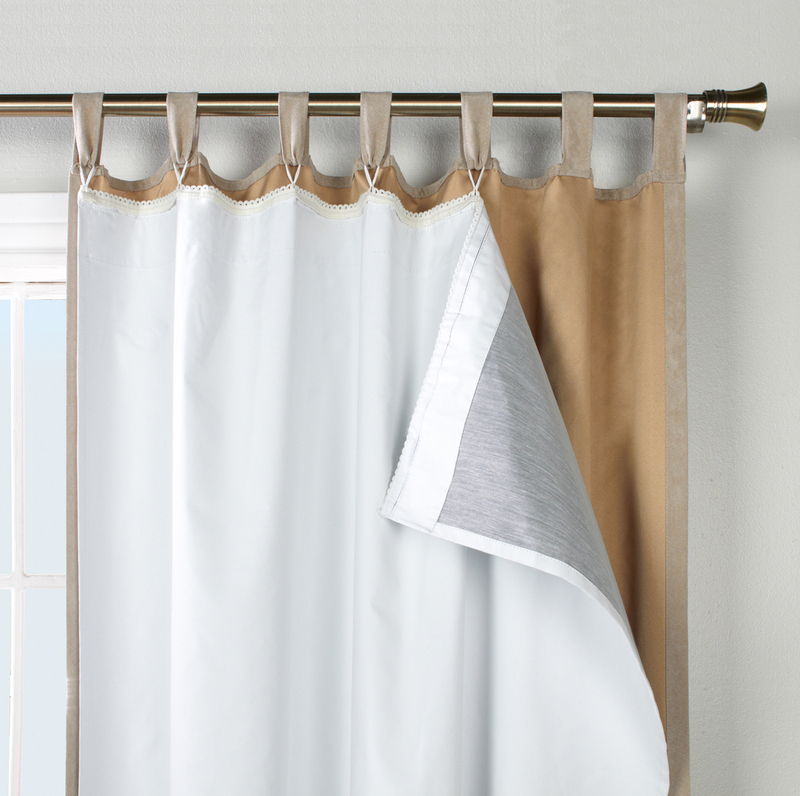 Simply insert a curtain rod through the fabric tabs sewn onto the top of each curtain and hang as desired. 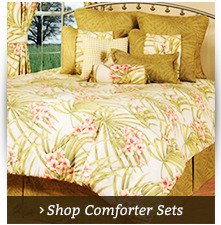 We offer discount pricing on top-quality curtains and a price-match guarantee to save you money. We also carry Weathermate Thermalogic tab top panel by Commonwealth Home Fashions to reduce heating and cooling bills. 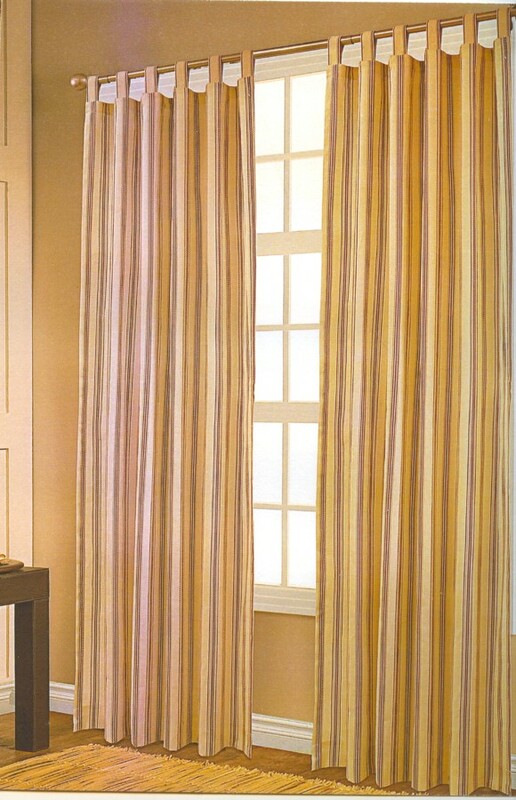 These machine-washable drapes are insulted to keep rooms cooler in the summer and warmer in the winter. They also act as a sound barrier to dampen outside noises and improve the enjoyment of your indoor spaces. 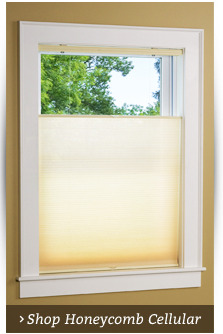 When closed, blackout tab top curtains block UV rays to protect carpets and furniture from fading. The white backing meets condominium requirements. If you prefer a lighter, airier look, consider Escape indoor/outdoor Velcro tab top voile panels by Commonwealth. The eight Velcro tabs per panel are reversible, and the machine washable poly fabric is treated to resist water, fading and mildew. Trust The Curtain Shop for the best selection of window treatments for your home. We have been in business for over 60 years and continue to do what we do best - offer high-quality curtains and window treatments at low prices to our valued customers.